Caterpillar Trains, an idea meant to take the train system to residential areas, has just won an Indian Railways engineer a global competition on innovations at Boston’s Massachusetts Institute of Technology (MIT). Ashwani Kumar Upadhyaya, 43, a 1997-batch officer of the Indian Railway Traffic Service, will now present his idea to academicians and town planners at a global conference in MIT in September. In a nutshell, the Caterpillar Train, or C-Train, envisages a citywide network of lightweight, elevated train coaches running at about 100 kmph on a track supported by poles bent into arches. The idea, which won in both the popular choice and the judges’ choice categories, was picked over 500 entries from across the world at the Climate CoLab contest. “The strength of the concept is its simplicity and its practicability. Some ideas are very good on paper, but not practicable. I guess we won because ours was both,” Upadhyaya told The Indian Express. Posted at the Centre for Railway Information Systems in New Delhi, Upadhyaya has been developing the idea for the last few years as a PhD scholar in MIT while on study leave. Instead of large coaches, the C-Train envisages a series of small, seating-only cars that would be “as high as an SUV” and capable of accommodating 20 passengers at a time. The coaches would have wheels both below and on top, so they can travel on the track and under it — giving it the appearance of a caterpillar. 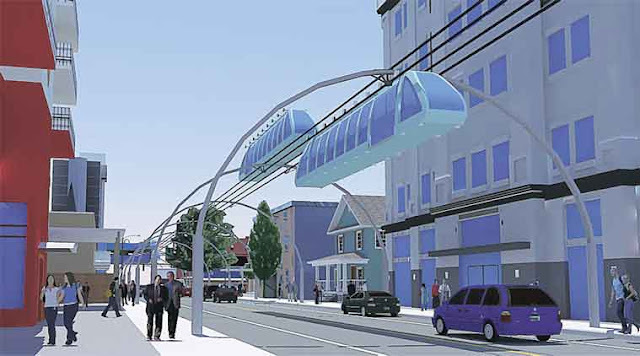 Unlike the conventional metro system, which relies on heavy pillars and corridors, the C-Train would run on poles joined together to form an arch. The system would run on electricity, with each car equipped with a battery in case of emergencies. The traction mechanism is such that both acceleration and deceleration are fast. Since coaches are smaller and lightweight and the poles require little land, the system is capable of penetrating residential areas, Upadhyaya said. Plus, it should cost a fifteenth of a conventional metro system. Each passenger will be able to choose his destination station by clicking on a console in front, he said. “Currently, all urban mass transit systems are developed on the hub-and-spoke concept — the transport system is the hub and users have to travel from various parts of the city and converge there to use it. But the C-Train goes wherever there is at least a five-metre road,” he said. Since coaches are seating-only, the load in each car would be limited. The stations, he said, would be designed as simple platforms accessible by elevators. The plan is to stack coaches on top of each other so that less land is required as compared to bus or metro depots. The “vertical depot” concept, he said, is a first for any urban transport system. The idea has been dubbed the ‘internet of urban transport’, because of the fact that it could bring a mass-transit train system within a kilometre of residential areas. Upadhyaya said he and his collaborator, fellow PHD scholar at MIT Emil Jacob, a Romanian-American, had to make several presentations and answer some tough questions before their idea was selected. “Let’s hope the idea does not stay only on paper and we can build at least a prototype somewhere in the world. The next chapter will come after that,” he said. The contest was organised by MIT’s Centre for Collective Intelligence, which aims to offer a crowd-sourcing platform where people work with experts to create, analyse and select detailed proposals on how to tackle climate change.